Occasionally if a rain falls in just the right area, water still flows in Bear Creek. 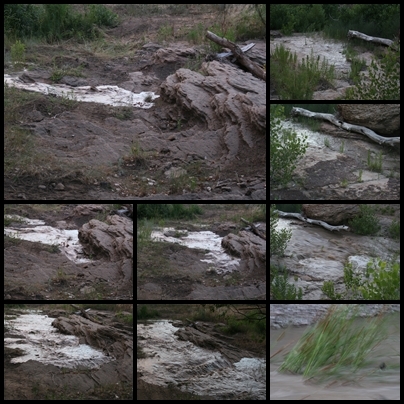 This summer Darci Batterton Smith captured these pictures of water coming down Bear Creek and splashing into the Manter Dam site. The excitement was fun while it lasted! Read the Manter Dam timeline. Directions to Manter Dam: 2 3/4 miles west of Manter on U.S. 160 to county road 17, just over 1 mile north on Road U, 4 1/2 miles west (past an old stone house) and then 1 1/2 miles north on a gravel road that curves around and ends in a parking area. No water or restrooms are available. Watch for rattlesnakes.